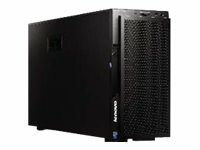 The Lenovo System x3500 M5 server provides outstanding performance for your business-critical applications. Its energy-efficient design supports more cores, memory, and data capacity in a scalable Tower or 5U Rack package that is easy to service and manage. With more computing power per watt and Intel Xeon E5-2600 v3 processors, you can reduce costs while maintaining speed and availability. UEFI, Integrated Management Module II (IMM2.1) based on Renesas SH7758, Predictive Failure Analysis, light path diagnostics panel with optional upgrade kit, Automatic Server Restart, ToolsCenter, IBM Systems Director and Active Energy Manager. Optional IMM Advanced Upgrade available for remote presence. 16GB (1x16GB) 2133MHz* ECC Registered (RDIMM) DDR4, expandable up to 1.5TB. Up to twenty-four DIMM slots are supported in total, with twelve slots per processor. One slot contains a removable 16GB module; the others are available. NOTE: Memory speed up to 2133MHz supported. NOTE: When only one processor is installed, only half of the DIMM slots are available. 16MB VRAM with Matrox G200eR2 graphics integrated into the IMM2. NOTE: Slots 3 and 6 support double-wide GPUs. NOTE: Slots 5, 6, and 7 require 2nd CPU. NOTE: Support for one RDX internal USB tape drive in one of the 5.25" bays. NOTE: Optional upgrade to RAID 5/50 is available for M1215. Calibrated Vectored Cooling with up to four hot-swap fans (two fans shipped standard on single-processor models and four fans shipped on dual-processor models). NOTE: For single-processor models, an optional Redundant Cooling Kit provides two additional fans for N+1 redundancy.